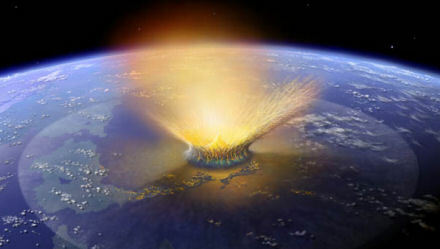 Niacin, or vitamin B3, could have been delivered to Earth by carbon-rich meteorites, say NASA researchers, whose findings support a theory that the emergence of life on Earth may have been assisted by a supply of key molecules created in space and brought to Earth by comet and meteor impacts. “Vitamin B3, also called nicotinic acid or niacin, is a precursor to NAD [nicotinamide adenine dinucleotide], which is essential to metabolism and likely very ancient in origin,” explained lead researcher Karen Smith (pictured). Smith was the lead author of a paper describing her team’s meteorite analysis work in the journal Geochimica et Cosmochimica Acta. 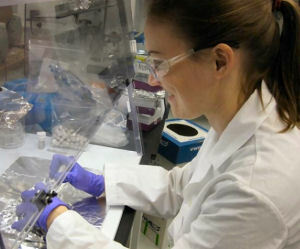 Smith and her team analyzed samples from eight different carbon-rich meteorites, called “CM-2 type carbonaceous chondrites” and found vitamin B3 at levels ranging from about 30 to 600 parts-per-billion. They also found other pyridine carboxylic acids at similar concentrations and, for the first time, found pyridine dicarboxylic acids. Asteroids and comets are considered more or less pristine remnants from our solar system’s formation. However, some asteroids are less pristine than others. 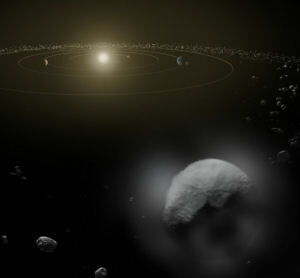 Asteroids can be altered shortly after they form by chemical reactions in liquid water. As they grow,asteroids incorporate radioactive material present in the solar system nebula. If enough radioactive material accumulates in an asteroid, the heat produced as it decays will be sufficient to melt ice inside the asteroid. Researchers can determine how much an asteroid was altered by water by examining chemical and mineralogical signatures of water alteration in meteorites from those asteroids. 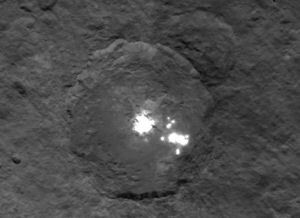 The team doubts the vitamin B3 and other molecules found in their meteorites came from terrestrial life for two reasons. First, the vitamin B3 was found along with its structural isomers – related molecules that have the same chemical formula but whose atoms are attached in a different order. These other molecules aren’t used by life. Non-biological chemistry tends to produce a wide variety of molecules – everything permitted by the materials and conditions present – but life makes only the molecules it needs. If contamination from terrestrial life was the source of the vitamin B3 in the meteorites, then only the vitamin should have been found, not the other, related molecules.